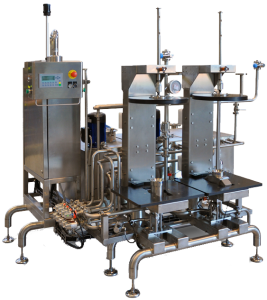 Robotic in-line system for speeds of more than 1,000 kegs per hour for higher line efficiencies than lanes and keg valve friendly operation. Generally the service tanks are supplied with the units. Industry standard components on the units to reduce total life costs and allowing the customer independence of spares supply from the local market. Modular constructions to allow the systems to be upgrade and extended. ALL EQUIPMENT IS pre-fabricated AND PRE-ASSEMBLED in the manufacturer’s works including all the service pipe work with the following results:-. Reduces installation time on site resulting in less customer downtime. This ensures the best quality of factory finish rather than building the line on site where the facilities may not be as suitable. 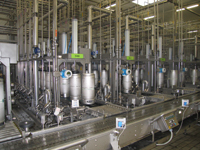 With some of the world’s largest brewery groups using this supply we are sure that we can meet your requirements in this sector large or small.